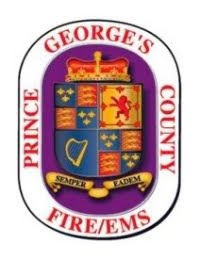 Critically Injured Crash Victim Thanks Firefighter/Medics "Angels in My Path"
Before sunrise on an October morning in Laurel two Prince George’s County Firefighter/Medics were driving separately on their way to work. They had no idea what they were about to witness in addition to quick thinking and actions would help to save a young mans life. The very man they helped that morning visited the Laurel Fire/EMS Station this afternoon to thank them and others firefighters that responded to help. Firefighter/Medics Damion R. Duncan and Michael R. Dugan were travelling in the area of Route 198 and Interstate 95 in Laurel. Duncan on his way to Laurel Fire/EMS Station 810 and Duncan on his way to Laurel Fire/EMS Station 849 when they witnessed a vehicle, for whatever reason, cross the median strip on Route 198, go airborne, leave the roadway and broadsiding a large tree. Both firefighters stopped to provide assistance with Dugan alerting 911 of the incident with an occupant trapped with life threatening injuries. Both firefighters worked to keep the victims airway open and treat his injuries until assistance arrived. Both firefighters knew that time was of the essence if this young man was going to survive. With the morning darkness and lack of other vehicles on the road it is quite possible that if this crash was not witnessed by the two firefighters it may have gone unnoticed due to its out-of-sight location off the roadway. Additional firefighters and medics arrived from the nearby stations and initiated extricating the adult male and arranging transportation by helicopter to a Trauma Center. The victim, 23 years-of-age, a West Laurel resident and graduate of Laurel High School, was suffering from a head trauma and bi-lateral fractures of his femurs in addition to other multiple injuries. As is the case with the majority of patients the treatment and transport would be the last contact personnel would have. However, Juan Morales was determined to survive and once released from months in the hospital and rehab, he wanted to meet and thank his rescuers. Morales reviewed the police report of his crash and located the names and phone numbers of the firefighters. They were listed on the report as they had witnessed the crash. Still recovering with mobility and speech he asked his girlfriend to contact the firefighters and arrange a visit. Morales accompanied by his girlfriend, mother and other relatives visited the Laurel Fire/EMS Station 810 this Friday afternoon, July 14, to meet the firefighters. They brought along a plaque and lunch for the entire crew. On the appreciation plaque presented to firefighters Morales referred to them as, "The Angels in My Path." Morales still uses a wheelchair and attends physical, occupational and speech therapy. He spoke in a low and raspy voice thanking the firefighters for everything they did that morning and how much he appreciated their help. He greeted each firefighter that was able to attend today's informal meet and greet and asked questions about that morning. He does not remember any events of that morning and asked Duncan and Dugan details about what had occurred. Each firefighter discussed details of the crash that Morales had never heard before. Fire Fighter/Medics attending today's event that were on the incident included Sean Roth, Matthew Von den Steinen, Frank Nicholson, Danon Ushinski, Duncan and Dugan. Deputy Fire Chief Dennis Wood and Battalion Chief John Thompson also attended the event. It is well known in the arena of public safety that awards are nice but there is nothing better than to meet a former patient that you never thought you would ever see again. That is the best award to receive. Fire Fighter/Medic Matthew Von den Steinen was on the Squad that extricated Morales from the car. A young man with critical injuries that was trapped in in his car that wrapped around a tree will stop by and thank firefighters and medics for everything they did. In October 2016 firefighters and medics worked feverishly to free the trapped crash victim, treat and transport him to a Trauma Center for his critical injuries. He called the personnel at the Laurel Fire/EMS Station and asked if he could have the opportunity to meet them. It is rare for firefighters and medics to be able to meet with a former patient. It is often at the request of the patient that this occurs and it is one of the greatest rewards or awards personnel could ever receive. To be able to shake a hand, get a hug and look that patient through the eyes of joy rather than the first time you had an encounter. Today, Friday, July 14, at 1:00 pm this young man, former patient and crash victim, will have the opportunity he wished and hoped for. To meet and greet as many of the crew members as possible from that day. The Fire/EMS Station is located at 7411 Cherry Lane in Laurel. The following images were captured by PGFD personnel after the young man was extricated.